Luis Buñuel Award of the First Independent National Film Contest, 1970. Luis Buñuel Award of the Third Independent National Film Contest, 1973. Llámenme Mike [Call me Mike] 1979, La sucesión [The Succession] 1980, Ratas de la Frontera [Border Rats] 1984, Gavilán o Paloma [Hawk or Dove] 1985, El Trailer Asesino [The Killer Trailer] 1986, Cabalgando con la Muerte [Riding with Death] 1989. "En 1969 realiza su primer cortometraje en 8 milímetros, lleva por título Tercer suspiro, con el que obtiene el premio Luis Buñuel en el marco del I Concurso de Cine Independiente convocado por el Centro de Arte Independiente de las Musas. Durante ese mismo tiempo inicia como asistente de dirección teatral y actor en algunas obras. Hace su debut formal como director dentro de la industria cinematográfica con La Sucesión " FilminLatino. "In 1969 he made his first 8mm short film, titled Tercer suspiro [Third sigh], which was awarded the Luis Buñuel Award of the First Independent Film Contest, summoned by the Muses Independent Art Center. During this time he began working as theatrical direction assistant and actor in a few plays. 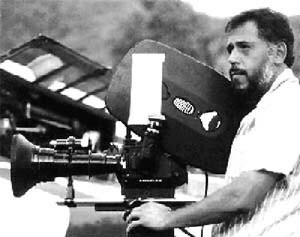 He made his formal directorial debut in the film industry with La Sucesión [The Succession]" FilminLatino.